Water scarcity is currently one of the major issues of the 21st Century. International conflict about Blue Gold has already arisen and is expected only to increase. Nowadays, over one-third of world’s population lives in water-stressed countries. In addition to population growth, it has been reported that another important cause of water crisis is climate change and its impact on the global water system and the environment. Glaciers, as the primary reservoir of potable water, influence global water management and marine currents. Their melting significantly increase water temperature and decrease its salinity. According to the National Oceanic an Atmospheric Administration global temperatures have been increasing steadily for the past 100 years and it is expected to continue to grow. Anticipated increase of only two degrees will cause vast of marine species stop reproducing and eventually vanish forever. Even though most of the Earth is covered by water, only 3% of its resources is potable. The only way to increase water supply are water reuse and desalination, whereas seawater desalination tends to be unlimited and eco-friendly. Currently the most popular desalination method is reversed. However, it still generates some inconveniences and one of its alternatives is freeze-thaw method. Freeze-thaw desalination is based on the fact that ice crystals formed are made up of substantially pure water. As saline water freezing point is lower, brine remains fluid. On the contrary to reversed osmosis freezing does not require high pressure difference thus the costs of the pump and membrane can be reduced. Furthermore, freeze-thaw method has lower energy demand and because of a low operating temperature it minimizes corrosion and metallurgical problems. 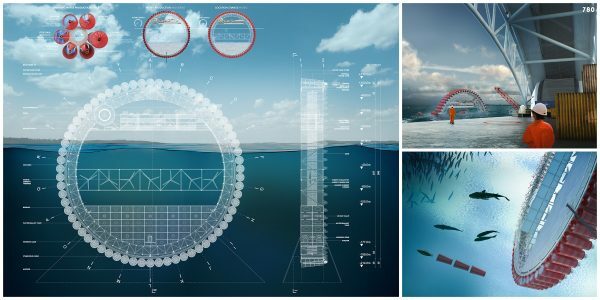 The project aims to use freezing-thaw desalination method not only to produce drinking water but also to regulate the temperature and salinity of the ocean. Icemill desalination plants could be localized all around the globe to reverse the effect of climate changes. As melting glaciers modificate salinity of water, Icemills could not only regulate its temperature but also water composition to restore natural environment for marine fauna and flora. The project consist of gyroscope structure where outer layer can rotate and produce ice. The ice would be assembled in tanks installed on refrigerators. As the process of desalination consists of three phases: ice formation, ice cleaning, and ice melting, outer mill rotates according to this cycle. The form of the tank has been designed in a way to support the freezing process – its shape causes that ice cleaning and melting can be pursued using only gravitational and physical properties. The tank itself allows also to increase the transport possibilities – clean water can be shipped not only by tankers. 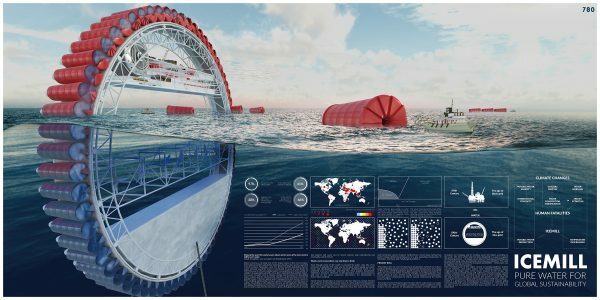 Inner immobile layer of the object consist of working platform, marine current turbines, and water ballast tank. Working platform allows employees for longer stays at the ocean, similarly to the oil rigs. The turbines maintain Icemill energy self-sufficiency. Dynamic ballast system and the anchored were used due to the need of unit’s mobility. When the object needs to change its location the anchor is raised while the outer layer increases its speed and transform the Icemill into a vehicle. Icemill is a proposal for development of industry that support global environmental and social sustainability. The question is – how much are we able to use its potential and how many species can we save from extinction?